A boy walks through a migrant camp in Calais, northern France. According to estimates, about 900 migrants and asylum seekers are sheltering in the area, many without toilets or washing facilities. 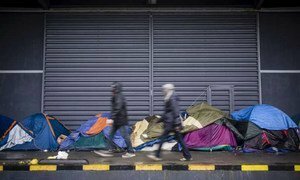 A group of United Nations human rights experts have called on the French Government to urgently provide water and sanitation services as well as emergency shelters for migrants and asylum seekers living in “inhumane situation” in areas along the country’s northern coast. According to estimates, over 1,250 migrants and asylum-seekers are living in Calais, Grande-Synthe, Tatinghem, Dieppe and other sites along the coast without adequate shelter and access to drinking water, toilets or washing facilities. “Migrants and asylum-seekers along the northern French coast […] are facing an inhumane situation, with some living in tents without toilets and washing themselves in polluted rivers or lakes,” said Léo Heller, the UN Special Rapporteur on the human rights to water and sanitation, in a news release on Wednesday. “Some efforts have been made, but not enough,” he added. Since last year, the Government has taken temporary steps to provide these services for some people, including contracting a local organization to provide water and shower facilities. It is also hosting up to 200 migrants at a sports centre in Grande-Synthe. “I am concerned that for every step forward, two steps are taken back,” stated Mr. Heller, noting that the situation is emblematic of the need for much more attention from national and international authorities on this issue. The experts also underscored that in the absence of valid alternatives in the provision of adequate housing, including in the Calais area, dismantling the camps was not a long-term solution. The UN rights expert making the call also included Michel Forst, the UN Special Rapporteur on the situation of human rights defenders. United Nations human rights experts are urging the Government of France to devise long-term measures to provide access to safe drinking water and sanitation for migrants in Calais and other areas along the northern French coast.